We're using Song of Blades & Heroes for our games, along with the excellent campaign rules in Song of Deeds and Glory. The idea is to use the map to guide the narrative flow of our game, rather than to get bogged down with fiddly campaign mechanics. The spirit of Song of Blades & Heroes is very much focused on casual, character-based story gaming, rather than min/max powergaming, and that fits well with our club's play style. Each player will begin with a 1,500 point Song of Blades & Heroes army. From that roster, players will assemble 300 or 400 point warbands for individual games. Losses are deducted from army lists, while survivors will gain experience. Here are the individual battle reports. We played about 20 games over the course of 7 separate sessions. Session 7 - Escape the Iron Isle! Session 4 - Burn Them Out! 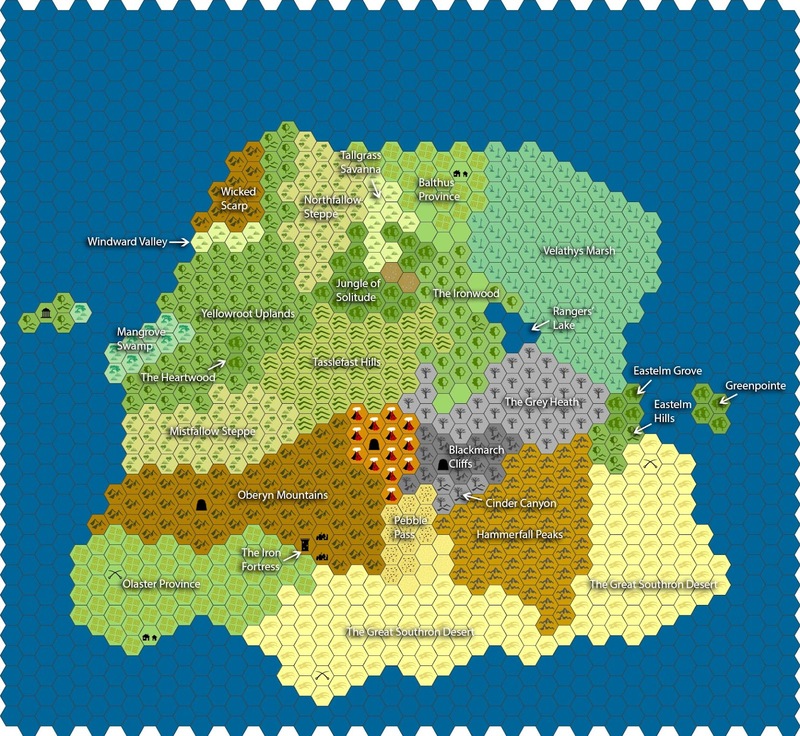 Here's a brief synopsis of our campaign world. Astute fantasy fans will recognize any number of inspirations and borrowed names on the map itself. leave and that stories of their direct influence were always overstated. a debate for another time. For now, we will assume that the gods do exist and did leave. into localized territories held be a shifting cast of warlords, wizards, kings, and charlatans. attacking those who served the newly departed demigods. metals, are highly valued and sought by adventurers who still wander into the remote places of world seeking artifacts in ruins, battlefields, schools of magic and abandoned castles. caves beneath the mountains and the volcanoes, perfecting their necromantic magic. After they awoke and began killing and taking anything they might like to, the Sabazian Empire initiated a series of wars against the dragons. When the empires crumbled and fell, the Iron Fortress was abandoned and has fallen into ruins. The shattered ruins are avoided by the small population that remains on The Iron Isle, for fear that any interference may release some foul necromantic magic. Indeed, the dead have been rising under the shadows of the ash cloud that blankets the island, given life by some as-yet-undiscovered dark magic. are few permanent settlements, with a handful of small farms clinging to the coastline in Olaster Province and Balthus Province. Adventurers come to the island, but they are regarded coolly by the cautious villagers who farm the agricultural lands, ever wary of the wilderness that lurks deeper within the island.